My article about skiing at Crater Lake just came out in the Oregonian, as did an article about snowshoeing with kids at Crater Lake. 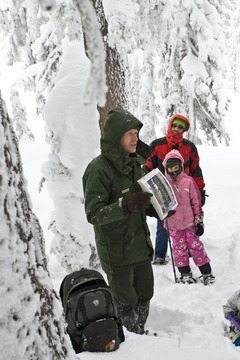 Ranger Dave Grimes holds up a photograph of lichen on a hemlock tree during the 1.5-hour interpretive snowshoe walk that he is leading. The author’s husband, James, of Ashland, Oregon, and daughter Hesperus, in the background. Photo by Jennifer Margulis. But when my husband and I took our three children to Crater Lake on a squally Saturday in December, we grown-ups sank into the snow, flipping the powdery stuff into the faces of those who walked behind us. The kids, on the other hand, had an easier time of it. They practically ran on top of the fresh snow. All three leapt up after falling, threw themselves down to make snow angels and buried themselves as if the snow were sand at the beach (brrr). “Just don’t stand too close to the walls,” Ranger Dave Grimes cautioned. We looked up to see icicles longer than baseball bats with dangerously sharp points clinging to the eaves. You don’t want them to fall on you. Then we set off. Out of the lee of the lodge, it was windy and very cold — somewhere in the low teens without the wind-chill factor. The snow and wind beat on our faces as we trudged to a small grove of trees. I was wearing a facemask and two hoods, and my head was still freezing. But since snowshoeing is hard work, at least on fresh snow, I warmed up. Once we hit a grove of mountain hemlock, we stopped for the first of three talks. Grimes explained that mountain hemlocks have downward-pointing flexible branches so snow falls off them easily and the branches bend but don’t break. He illustrated this by having a visitor wrestle a tree to the ground. It wasn’t much of a contest. Afterward we had minestrone soup and watery imitation hot chocolate at the Rim Village Cafe. My husband’s toes were numb (he was wearing sneakers) and it took me several cups of coffee to get the chill out of my bones. “It’s so beautiful out there,” said Albie Pokrob, 53, of Ashland, who was on our walk with his 7-year-old daughter, Sierra. “And scary, when you get near the edge,” Sierra added. There was only one drawback to this fabulous winter family activity: There’s no place to stay within 60 miles of Crater Lake in the winter. We drove back at nightfall on roads that were icy and snow-packed. A drive that takes less than two hours in the summer lasted almost four hours this time.